I made these Panda Bear and Monkey Cakes for my daughter Melody's birthday. We thought they turned out really cute! I asked Mel what kind of birthday cake she wanted this year and she picked a monkey cake. Once I got started I realized I had enough batter to make two cakes, so I decided to surprise her with a panda bear cake as well. These cakes were really pretty easy to make. You can use your favorite homemade cake mix or just a box mix if you prefer. Bake the cake in a 9 inch round pan(s) and let it cool. After cooling the cakes, for the monkey I cut out two small sections on either side of the round in the shape of a backward c to make a hollow for the ears. Then I took a toothpick and just eyeballed where I thought the mouth should go and made a small outline with the pick. Next, I frosted the entire cake up to the toothpick outline with chocolate frosting. I then added a few drops of red food coloring to some vanilla icing to make it pink and filled in the mouth area. I used small chocolate donuts for the ears by placing them where the cutouts were on the sides. For the eyes I rolled out some white fondant and cut out circles a little bit bigger than the small York peppermint patties. I then placed the patties on top of the fondant and took two small pieces of white fondant and shaped it for the whites of the eyes and placed them in the upper edges on top of the peppermint patties. pieces and then sliced done the middle for the mohawk hair sticking out the top. Finally, I placed two black jelly beans for the nose and a red smile made of red jell icing. To make the Panda bear cake I began by frosting the entire cooled cake with a vanilla icing. For the eyes, I again started with two small York peppermint patties and this time placed the shaped white fondant on top of the patties. To make the pupils I cut one black jelly bean in half and placed each one cut side down on the white fondant. For the line of the nose and mouth, I used a whole chocolate Twizzler (licorice), slicing it up the middle about halfway and bending the sliced sides outward as shown in the photo. I then used one half of a small chocolate donut and placed it at the top of the licorice for the bridge of the nose. I also used a third small mint pattie cut to fit in the spaces where the mouth would be, filling in the gap between the two spliced licorice halves. I again made a bit of pink icing using the red food color with the vanilla frosting and putting just a bit on the mint patty in the shape of the mouth with red jell icing for the tongue. I finished off the panda bear cake by using two more small chocolate donuts with a small slice off of the ends and placed them on top of the head spaced appropriately for the ears. That's about it! 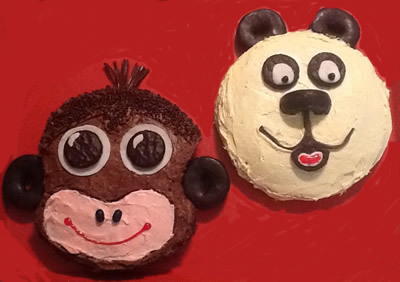 My kids loved the monkey cake and panda bear cake and they really were pretty simple to make. I hope someone else will enjoy making them for their own children. Thanks for posting. My 10 year old daughter wanted to enter a cake for 4h cake competition. This was perfect for her, simple but fun. Thanks so much for adding your photo of the monkey cake and panda bear cake. They are adorable! Thanks, too, for giving us instructions on how to recreate these animal cakes ourselves. That's very much appreciated. I know I won't be the only one who will enjoy seeing them. Keep adding your creations as you make them!